Episode 113: "Delayed in Honolulu" airs Friday, January 8 at 8:30pm on ABC. This week on Dr. Ken, Ken Jeong gets passive aggressive with guest star Dr. Oz. 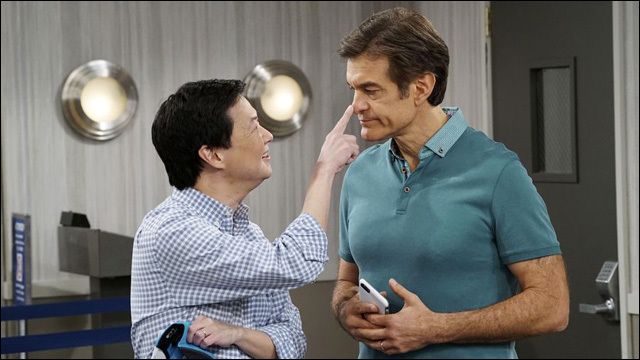 It's a doctor showdown between #DrKen and Dr. Mehmet Oz. The Park family is in the airport on their way home from Hawaii when their flight is delayed for several hours. Ken has an interaction with Dr. Oz that goes awry -- and then needs to get the famous TV doctor to switch airplane seats with him. Meanwhile, Allison gets overly involved in Molly's love life and accidentally breaks up with her boyfriend via text message, and Dave finds himself in a high-stakes card game with some college students. Back at Welltopia, it's "Black Monday," the clinic's busiest day of the year, and in Ken's absence, Julie is the doctor in charge, and Clark and Damona have to help her learn that thoroughness doesn't have to take forever. Guest starring is Dr. Mehmet Oz as himself. "Delayed in Honolulu" was written by Mike Sikowitz and directed by Anthony Rich. Executive producers are Mike Sikowitz, Ken Jeong, John Davis and John Fox. Mike O'Connell is a co-executive producer. "Dr. Ken" is produced by Sony Pictures Television and ABC Studios.